The Baltimore Orioles took Ben McDonald first overall in 1989 and an Orioles minor league coach Tom Brown had a special interest in the selection, according to The Associated Press. That's because Brown had coached McDonald before, McDonald's freshman year at Louisiana State University. It was Brown who even recruited McDonald to go to LSU in the first place, The AP wrote. "He'll play for me here when he signs," Brown told The Alexandria Daily Town Talk about a month after McDonald's selection. "I just hope his values haven't changed. When I recruited him, he wanted to play ball." McDonald eventually did play ball, doing so in the majors for nine seasons. And Brown has gone on to continue to coach in the minors, helping others get to the majors for more than two decades. Among those other players was one Johnny Cueto, who later credited Brown with turning him into a major league pitcher. But Brown's career in baseball stretches back much further, back to 1971. His career in baseball also saw him make the majors as a pitcher, pitching briefly with the 1978 Seattle Mariners. Brown's career began in 1971, signed by the Royals as an undrafted free agent out of the University of Louisiana-Monroe. Brown is credited as playing that season at rookie Kingsport, getting 17 outings and a 4.50 ERA. Brown, though, isn't credited as playing again until 1976. That year, Brown is credited as playing at independent Baton Rouge, going 9-1 over 13 starts. Brown joined the Astros system for 1977, playing at AA Columbus. He then played 1978 with the Mariners at AAA San Jose. It was in September 1978 that Brown got his only call to the bigs. Brown got into six games for the Mariners that September, giving up six earned runs in 13 innings of work. He gave up two of those earned runs on a Fred Patek home run Sept. 19, pitching four innings. He also got praise from his manager Darrell Johnson. "You had to like the way he pitched even though he did give up Patek's homer," Johnson told UPI afterward. "After all, Kansas City is a really good ball club and I thought he pitched excellent baseball." Brown continued playing in the minors into 1981. Soon after, he started his coaching career, going through LSU. 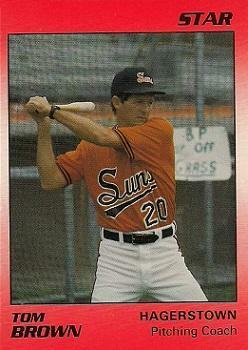 He joined the Orioles system in 1988. Brown moved to the Rangers system for 1995, serving as pitching coach at AAA Oklahoma City. He then went through the Padres, Marlins and Giants systems, before finding a home with the Reds. Brown served as pitching coach at high-A Sarasota from 2007 to 2009. He has been the pitching coach for the Reds' AA team since 2010, serving as pitching coach at high-A Daytona in 2018. At high-A Sarasota in 2007, Brown helped tutor young Reds prospect Johnny Cueto. By the next year, Cueto was in the majors. To MLB.com later, Cueto had nothing but the highest praise for Brown. "I am where I am today because of him," Cueto told MLB.com of Brown. "He was a pitching coach, but he was like my baseball father. You want a coach that will treat you that way and is not yelling at you all the time. He makes you listen because he has the right approach. This is hard sport and you have to get the best you can. He got the best out of me."